"...Pharaoh's Island is one of the most blatantly picturesque spots in the entire gulf..."
Just a few kilometers south of Taba, at the very top of the Gulf of Aqaba and just a few hundred meters from the coast, lies Pharaoh's Island. Surmounted by the imposing crenellated bulk of the restored citadel of Salah ad-Din, Pharaoh's Island is one of the most blatantly picturesque spots in the entire gulf. While the restored fortifications have firmly imposed a medieval character upon the island, the history of Geziret Faroun in actually one of exceptional complexity and interest. The earliest recorded constructions on the island are those of Hiram, king of Tyre (c.969-936 B.C. ), a friend to both David and Solomon. Tyre, an ancient city situated just off the coast of present-day Lebanon, was in Hiram's time one of the most powerful cities of the Mediterranean. Hiram figures prominently in the Bible (see Kings 9-10), where it is related that he supplied much of the cedar and gold for the Temple of Jerusalem. 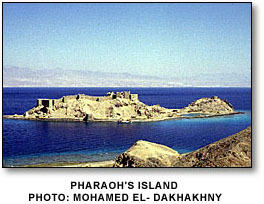 Hiram's interest in Pharaoh's Island, which he knew as Esiongaber, was to further develop trade with Egypt, and he built up the island's fine natural harbour. About two thousand years later, the Byzantines occupied the island, and they were followed there (in the 12th century) by the Crusaders and then by Salah ad-Din. In 1182, Salah ad-Din rebuilt the Byzantine and Crusader fortifications and further strengthened the island's defences, and it is his "Kasr El-Hadid" that has in large part been restored here. One little-known episode related to Geziret Faroun is a visit paid to the island by the young T.E. Lawrence, better and later known as "Lawrence of Arabia." While on a survey expedition to the Sinai in 1914, Lawrence asked for, and was refused, permission to visit the island and its ruins, then under the control of the Ottoman Empire. Having failed to secure a boat with which to defy this refusal, Lawrence built for himself a makeshift raft, on which he and his bedouin guide managed to swim out across the bay. Twenty-six at the time, Lawrence appears to have been more enthralled by the sheer adventure of the episode than by the evocative ruins on the island itself.